At Equitack, we guarantee your complete satisfaction. Order the saddle of your choice, with the peace of mind that if for any reason, it’s not the right one, you get your money back. No question asked. It’s simple: from the day you receive your saddle, you have 14 days to try it to make sure it’s the right match for you and your horse. If you wish to return it, ship it back within 14 days, as soon as we get it back, we process the refund. We ensure that your refund is processed within less than 2 business days* upon reception of the saddle at our offices. We refund the full amount of the saddle that you ordered. There is no refund on the shipping charges. We are always around to help! So never hesitate to reach out for questions, suggestions and advice. 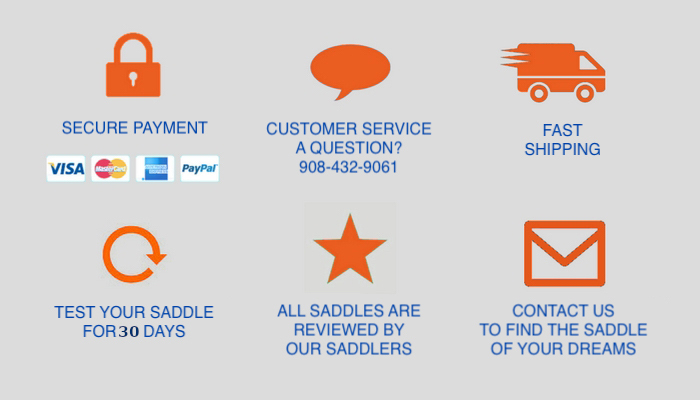 We are saddle experts and we will have an educated answer for you. We encourage that you give your trial saddle a fair test ride, therefore we anticipate a normal use of the saddle for up to 3 hours. In case of a return, we expect to receive the saddle back within the same condition than which you received it. So keep the packaging and please return it the same way it was packed for you. Always return the saddle with the cover on and always make sure to seal the box properly. However, please take good care of the saddle. Don’t get it wet or too dirty. Please do NOT clean the saddle if you return it. We clean and condition the saddle ourselves at not charge before and after the trial. Think about taking pictures to illustrate your questions or concerns. Here are some sample pictures that will help us help you.